Usually found in rainforest in litter and under rocks and rotting logs; also in damp places in well-treed gardens. Native of closed forests in eastern Australia. Harmless predator of soil fauna. 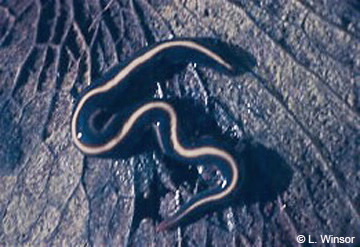 Length about 8-10 cm. Thin, dark blue-green with cream longitudinal stripe above, paler blue below. Narrow head often with pinkish tip, with multiple eyes.